Sakai Guides and DocumentationAssessments and Grading AssessmentsHow do I give specific students different time or date settings for an assessment? Some students in your class may need different assessment settings from others. For example, a student could require extra time on a timed assessment, or multiple rosters or sections in the same course site could be administered the same assessment on different dates. The Exceptions to Time Limit and Delivery Date settings allow instructors to create exceptions for specific students, without having to create separate copies of the assessment. 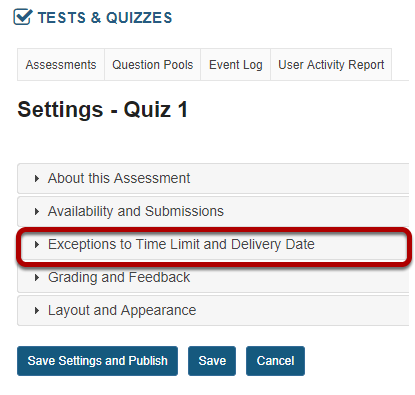 In the assessment Settings page, click Exceptions to Time Limit and Delivery Date. Select the user from the drop-down list of enrolled students. Or, select the group from the drop-down list of groups in the site. Note: You must have existing groups in your site in order to select a group. 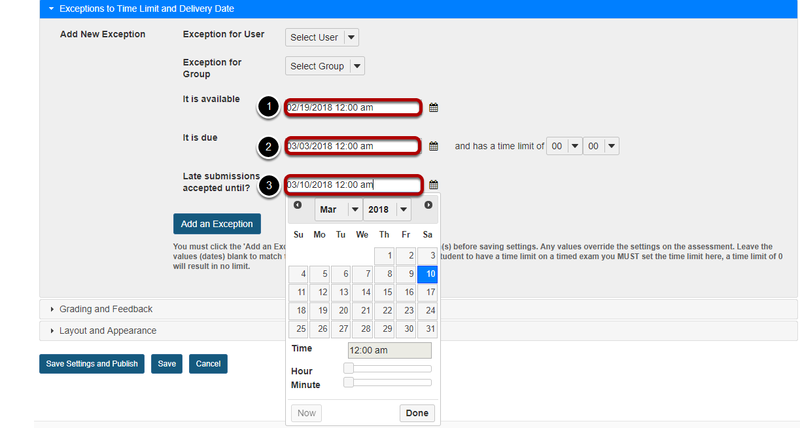 The availability dates let you specify when your assessment can be accessed by the selected student or group. If you don't specify any dates, the default dates will be the same as the existing assessment settings for all students. This setting will override the normal availability dates for the assessment for the selected student/group. If you are only changing the amount of time allowed for the test, and not the test availability window, you may leave the dates unchanged. Use the date-picker (calendar icon) to select a new date and time if desired. The Late submissions accepted until? date is the end date for late submissions on the assessment. If late submissions are not accepted, this date should be the same as the due date above. Select the desired time limit from the drop-down menu. This setting will override the normal time limit setting for the assessment for the selected student/group. If you don't specify a time limit (i.e. time limit of 0), the student will have unlimited time. Once saved, any exceptions for this assessment will be listed here. You may select Edit to make changes to the exception dates/time, or select Delete to remove the exception. Prev: What are the Availability and Submissions options for an assessment? Next: What are the Grading and Feedback options for an assessment?